It is necessity that employees should take some amount of time as a break from work so as to focus on other problems and events that occur in their lives. By saying this, employees should not take this for granted and make it as a consistent habit. This can disrupt his/her productivity to the company and also cause problems for the rest of the employees. If unnoticed, this can be a big issue for the whole company and can cause a lot of grievances and monetary loss. In any case if an employee is ditching work periodically or regularly, then certain steps and guidelines should be followed to handle the issue. Keep in mind and know that a lot of decree and regulations to be followed, when keeping an employee disciplined or being terminated wrongfully. When addressing an issue of turnover or absenteeism, try to strictly adhere to the decree and regulations and the law. Employee protection is a primary issue for many developed and developing nations. The priority of the family and medical leave act is to safeguard the employee from any kinds of disciplinary action or from being terminated due to any important life events. When workers are under this act, the employee must provide prior notice to the office that he/she will be absent from work for the following reasons protected in the FMLA and proper documentation and proof must be provided. Child birth, maternity leave and taking care of the child till the first year. Adoption of a child or taking care of a child, till the age of one year. Taking care of a spouse, parent or child having a chronic medical condition. Failure to perform well or do day to day activities due to a complicated health condition. If you have an employee who is suffering from a disability, as an employer it is your duty to provide him/her with necessary accommodations so that they can perform their tasks under such hardships. If you have such an employee, then try to ensure that he/she may be missing from work due to the said reason and may need some assistance. Make sure that this is the case before taking any necessary actions. 4. This act protects people from being discriminated against on the grounds of colour, gender, race, religion or national origin. Try to ensure that the employee is absent because of any religious or the above said reasons before taking any disciplinary actions. Try to respect the employee’s religious sentiments. This act protects the rights of the uniformed employee when he/she has returned from serving in the army or military up to a certain period of time. Try to understand that he/she might be dealing with many issues such as emotional, anxiety and social issues and might need some time to recuperate with the normal lifestyle. Try to understand that the employee might not be able to work properly because of these reasons. Before addressing any issues related to employee attendance and absenteeism, try to ensure that you are fully aware of the company’s attendance policy. Try to read through the policy. This is necessary if you are going to tackle an employee regarding this issue. Try to ensure that the employee is being absent regularly, before taking any necessary actions. These kind of situations should be clearly stated in the company’s attendance policy. Another way of determining whether the employee is taking regular offs from work is by comparing the performance of the employee to other employees having the similar position and similar jobs. If the employee has shown that he/she had missed work due to a personal or a family reason, then he/she should provide the necessary proofs. This shows that his/her reasons were legitimate. The reasons may include a repeating physical problem, death of a close family member etc. Any disciplinary action will be unnecessary if the employee is suffering from a health problem, provided that he/she has submitted a medical certificate or a doctor’s note to the company. Try to understand the condition of the employee and ask them how much time they would need from work. As an employer, it is unprofessional to ask them the diagnosis details about the employee’s condition. Though it is okay to ask a doctor’s letter from the employee, to schedule the time for the employee. Always keep in mind that a legitimate reason might have different excuses, even if they are the same reason. If the candidate has a proper excuse and a proof to solidify the excuse, then always give the employee the benefit of doubt. Do not give the employee the feeling that he/she is distrusted, he/she might feel the need to defend himself and this might result in a feeling of dissatisfaction and stress from the employee’s side. If your employee do not have a proper explanation or do not have an evidence for absence, then you should take the necessary actions. Take time to learn the records and performance history of the employee. If the employee has had a perfect work history or has given a stellar performance, then a new pattern of poor work is likely to be a result of genuine problem , or this could indicate that the employee is not happy with his/her current job. Try to hold a meeting between you and the employee. Try to inform the employee about the meeting as discreetly as possible, preferably by email. You do not want to embarrass the employee in front of others, especially if they have genuine reasons for being absent from work. Calmly explain the concerns and consequences of regular absence to them. Simply state that, as an employer you are seeing a pattern of absenteeism in their records and say that you are trying to ensure that whether or not the reasons are legitimate or if they need any help in improving the situation. Refrain from stating any suspicious remarks about their absenteeism as this may cause an unwanted clash between you and the employee. Let the employee explain the reason for their absence. Keep in mind that during this process, he/she might have to share a very personal information to you. Try to be as benevolent and kind as possible. If the employee does not have a valid excuse for his/her absence, then you should be calm and composed. It may not end well if you scold the employee or embarrass them, if you are interested in keeping them as your workers. Always keep in mind that neither the company nor the employer has the right to solve the candidates’ personal or private problems. The main focus of the company is to give the employee the necessary resources and support so that the employee can perform well in his/her job. Try to encourage the employee and try to be adjustable if possible. Explain why it is impossible in some cases, even though the reasons may be urgent. Try to make the employee understand that regular turnover can cause loss to the company and can disrupt the company’s performance. Also, it may affect the professional relation between the employee and his/her colleagues. They might blame the sloppiness to the employee for his/her absenteeism. If you have come to the conclusion that the employee’s absence is not related to any urgent or genuine issues, then try to verbally warn the employee that he/she has to upgrade or has to face disciplinary actions. Document the meeting and make it clear that verbal warning was given. It is important to note that the issue was discussed in the meeting and the necessary warnings were given. This might help to prevent any disagreements that occur on what happened and what did not happen in the meeting. If the company has a set of specific guidelines regarding the employee attendance, then try to explain these guidelines in detail to the employee. Give him guidelines on how their attendance will be audited and be discreet about the various situations which may be considered justifiable reasons and situations which are not considered for taking a leave. 2. Also makes sure that the employee is conscious of the concept of paid and unpaid leave. If he is designated to a sick leave, holidays and vacation or regular days off, then explain to the employee that he/she has to give prior notice so that necessary adjustments can be done. 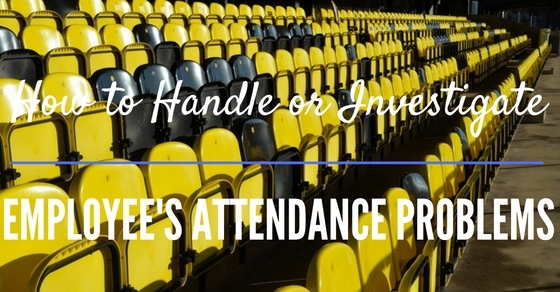 Warn the employee about the consequences in declining to improve the attendance records. Make sure that the employee understands the importance of improving the attendance record, otherwise he/she has to face consequences, and this may include possible lay back or benching from the job. Sometimes the employee can be apprehensive to do work at the office, maybe due to any form of harassment or bullying from the other employees. Because of this reason, the employee may be feeling a sense of burnout or maybe discontented with a particular aspect of the job. As an employer, you might be able to solve the employee’s professional issues by providing them with the proper support and resources and encouraging them to boost the situation. After you and the employee has discussed what the underlying problem was, it’s reasons and how it can be tackled to solve the situation, convey the whole process in the form of a written format that conveys this information. Also include a statement stating that the employee has accepted the situation and knows what all consequence he has to face, if he does not upgrade his attendance and as well as places for the signatures of both the employer/supervisor and the employee to sign on. Remind all the employees the company policy for employee attendance and also the decree and regulations regarding this issue. Also, show a consistent behaviour while enforcing the attendance decree. Do not show any favouritism to any employee, otherwise it would interrupt the integrity of the rule enforcement. Always check the attendance records to see if any of the employees are again showing periodical absenteeism and take necessary disciplinary actions, if found. Whenever the employee comes right on time or shows a consistent attendance and a stellar performance, praise the employee and provide him with incentives. If the employee fails in improving his attendance, then consider taking a disciplinary against him. This can be in the form of a written letter, suspending him for a few weeks without any pay or terminating them from the job. Consider taking disciplinary actions, depending on the work history of the candidate. The best method to tackle employee absenteeism is to train and supervise all employees present in the company to properly follow the company’s decree and regulations. In this manner, a proper relationship between the employer and the employee could be maintained.